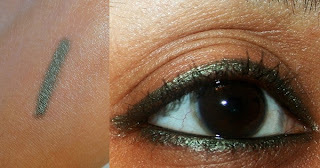 When I'm in the mood for green eye liner, Mildew & Stash(both by Urban Decay) are the two liners I reach out to the most. Mildew is a metallic, medium green and one of the few liners that actually looks green on me. It has enough color to add a nice pop without being too bright. The texture, like most UD's glide on pencils, is buttery smooth. But, Mildew does not stay on for more than a couple of hours on my waterline. So, I like to use on my upper lash line and on the lower lash line, usually with a jet black liner on my waterline. On the lash line, the formula adheres well and stays put for a few hours without transferring much. If you haven't ventured much into the green liner territory, Mildew is a great one to start with. Even otherwise, it is a beautiful color to have in your stash. What is your favorite green liner? This is one of my favorites, for sure! I've never though I would like a green liner, but this one is really lovely! I bought a nice green from NYX from the slide on pencils range called "olive" and I adore it! It's smooth, applies like a dream and stays on forever. I haven't tried the UD ones yet but I heard that the Nyx ones are very comparable! Oh really? I haven't tried them yet! Will check it out sometime :) Thanks for letting me know! I love Mildew! It's such a great fall/winter color: I use it all the time!